Words cannot describe the warm, fuzzy feeling that runs through your body when you pop one of these bad boys into your mouth. A perfect treat for any special occasion that is easy to eat, pretty to look at (but not for long) and fun to create! I made these peanut butter chocolate "truffle" bites for my boyfriend on Valentine's Day. We're both health fanatics, so I knew a box of Godiva chocolates weren't going to cut it. Excess sugar from any source is not OK on a regular basis, but the quality ingredients used in this recipe actually provide nutritional benefits. Well, it's much better than eating a Reese's; the same taste--I think better, but I'm biased--without the processed, artificial sugar and ingredients. In a large bowl, add in the peanut butter and place in the microwave for 20 to 30 seconds (to soften for mixing purposes). With your (clean) hands, roll dough pieces into nickel-size balls and place on a cookie sheet lined with parchment paper. Stick in freezer for 5 to 10 minutes. On a cookie tray, place the unsweetened vanilla coconut flakes into the preheated oven for 5 to 8 minutes (until the flakes turn a golden brown color). Remove from oven and mix in cinnamon. Set aside. In a small saucepan, combine the coconut oil and chocolate morsels on a medium-low heat. Stir the chocolate occasionally as it melts. Remove from heat when fully melted. Now make a conveyor belt (this part reminded me of Lucille Ball in that episode when she stuffed her mouth with chocolate...except I ate them voluntarily). In four small bowls, I added each of the toppings: the peanut butter flour, the cacao powder, the honey and the cinnamon toasted coconut. I assembled the melted chocolate (still in the pan) and the topping bowls ready to dip and dunk. Place the tray with chocolate-covered balls in the fridge for 5 minutes. Using a spoon, carefully take each ball and roll around in topping of choice: peanut butter powder, cacao powder and cinnamon toasted coconut (I left a few just chocolate coated). 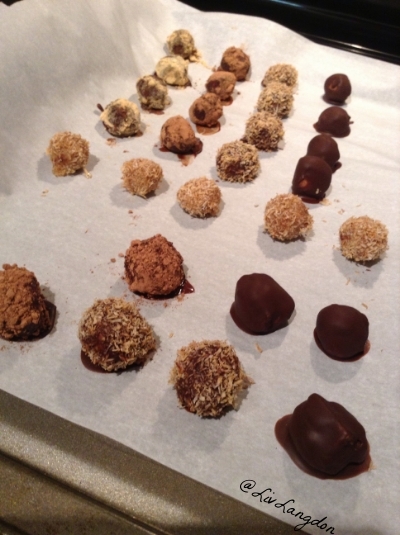 For the plain peanut butter balls you left out, dip in the honey and roll in the toasted coconut. For the Quest bar balls: cut the bar into eight slices and microwave for 10 seconds. Roll each slice into a ball. Repeat steps No. 8 to 10. Place the tray into the freezer for five minutes to set, and keep them in fridge until ready to serve. Buy sticks and make little peanut butter pops. Buy clear baggies (at a convenience store), fill them up with each topping flavor, and tie or wrap with a pretty bow.